The Call of Duty Series Gamepack for Titan One has 56 distinct MODS grouped into 12 classes, specially optimized for Modern Warfare, Modern Warfare 2, Black Ops and Modern Warfare 3. This Gamepack allows you to make up to 165,473,280 combinations of MODS. Jitter mode allows user to shoot single/burst fire weapons as fully automatic for ultimate firepower. When using any burst weapon, activating jitter mode decreases the time between bursts, making guns shoot faster. Jitter mode is effective at close range but might reduce its accuracy at long range. Jitter no longer works as of Modern Warfare 3 but still works in all pervious Modern Warfare versions of CoD. Jitter Black Ops is very similar to the original Jitter, but uses a special button combination to work with some patched guns such as the shotgun in Black Ops. Fast Reload is a mode enabling a player to reload a weapon fast than normal. Fast reload is most effective in Modern Warfare, Modern Warfare 2, and Modern Warfare 3. It is not as effective in Black Ops because Black Ops uses a different graphics engine that is not susceptible to the same fast reload glitch. NOTE: Fast reload does NOT work on some shotguns or sniper rifles. Fast reload only works on guns that have a magazine or clip. It will not work on weapons that load rounds one at a time. There are several factors that affect fast reload including the perks you select. Perks such as Sleight of Hand will actually change the fast reload timing. Different weapons also have different fast reload settings. Works with all COD games except Modern Warfare 3. Works with Modern Warfare 3. You must be holding a Semtex grenade for this fast reload mode to work. Turbo Melee significantly decreases the time the character has to wait between knife attacks in Modern Warfare, Modern Warfare 2 and Modern Warfare 3. It can also be used to decrease the wait time between Riot Shield melee attacks. Once you have activated Turbo Melee, all you need to do to perform a melee attack is press your melee attack button. Get ready for knife kill sprees and easier kills with your riot shield! Turbo Knife for Modern Warfare and Modern Warfare 2. Turbo Riot Shield for Modern Warfare and Modern Warfare 2. Turbo Knife optimized for Black Ops. Turbo Riot Shield optimized for Black Ops. Turbo Knife works with or without quick draw pro perk enabled and Turbo Riot Shield with melee proficiency enabled. For Modern Warfare 3. Turbo Riot Shield without melee proficiency enabled. For Modern Warfare 3. 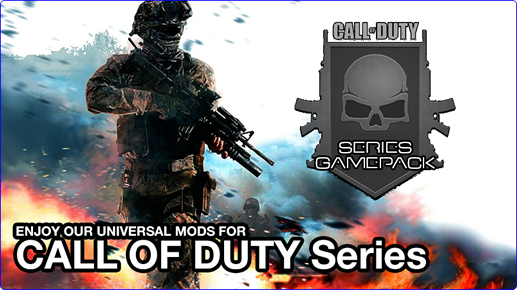 The Call of Duty Gamepack allows you choose and combine one MOD from each Class, being possible to have a total of 12 active MODS at the SAME TIME. This means you can make combinations such Burst Fire added to Rapid Fire, resulting in an exclusive "Automatic Burst Fire" MOD. The Automatic Burst Fire can be optimized by adjusting the number of bullets fired per burst as well as the time between bursts. For additional optimization, you can add the "Scope Enable" MOD, which will make the Automatic Burst Fire be activated only when the ADS scope is in use.